This is a hike that we have been talking about doing since we moved up here in 1997. I would have to say that once you clear tree line, it may be the most beautiful of the hikes we have taken. 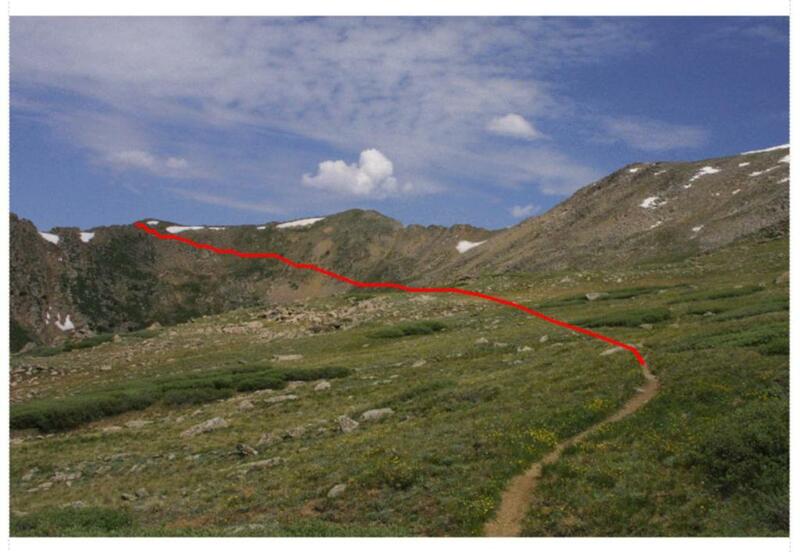 This is a two car hike, with one car parked at A-Basin and the other at Peru Creek. Unfortunately I screwed up and somehow lost all of the pictures on the small camera, and did not take all that many on the large camera. Lenawee Mountain is the mountain that Arapahoe Basin Ski area is built on (at least on the north side of the mountain). The back of the mountain (from A-Basin's point of view) leads down into the valley where the town of Montezuma is, and specifically for this hike, Peru Gulch. After oversleeping by 45 minutes, we got ourselves moving and drove up to A-Basin, where we left Marina's car. We then drove to the trail head. I would recommend a car with good ground clearance, or add an extra 1.6 miles on to your hike by parking in the parking area where the dirt road to Chihuahua Gulch takes off of the main road to Montezuma. To get to the trail head, head out of Dillon towards Keystone on US 6. Turn into Keystone like you were going to park at the River Run parking lots, but keep going. The road will end in a T, with a left turn taking you back to Dillon, and a right turn putting you on Montezuma Road. Take the right turn. As you drive towards Montezuma, eventually the road will take a hard left, followed by a hard right. At the beginning of the hard left you will see a sign for a bed and breakfast. Then as you come into the hard right turn, you will see a dirt parking area with a dirt road leaving from it. Take this dirt road 1.6 miles. You will pass the Maid of Orleans mine, and then a quarter mile later come to a sign that says Lenawee trail Parking on your right, almost immediately followed by a sign indicating the Lenawee trailhead on your left. The parking is a bit iffy. You have to look for places on the right where you can get your car completely off the road. There is no parking area per se. The Montezuma road is shown in red, and the Chihuahua Gulch road in purple, to the trail head. Here is map of the hike as plotted by the GPS. Like the Sniktau hike, my modifications on how I use the GPS gave me essentially a noise free plot, even in the trees. You should be able to right click on this map to view it alone and print it. Looking at this map and comparing my gps plot with the trail as plotted by the USGS, you can see significant differences. The main difference is at the 1 hour point, where the USGS has the trail going straight up the mountain versus what we walked which took a more gradual route. I saw no indications of trails getting re-routed, so I suspect the USGS in this case has it wrong. The trail itself was easy to follow, and was laid out in a manner to minimize the "ups and downs" as well as to work around boulder fields and scree. The steepest portion of the hike was the first hour, then the incline became somewhat less. The first portion of the hike, a little over an hour is in the trees and follows a westerly coarse up the mountain. At about 45 minutes we crossed a stream not shown on the topos. This may be an intermittent stream, not running in a really dry year. It is also the only water we came across on that side of the mountain. If you bring a pet, you need water for it. If you look to the south (your left) you will occasionally see views of Montezuma. This is a merged image of 5 pictures. You can see the trail on the right hand side of this picture. I have drawn in here the path of the trail. It basically goes through the bowl, always gaining elevation at a moderate pace. Crossing over the ridge brings you insight of the out of bounds markers at A-Basin. When you look at this in person, it looks very foreboding, but in point if fact it was no problem at all. The views to the south were outstanding. We stopped below the Lenawee lift to have a 20 minute lunch and then continued down the road to US 6 and our car.